There are numerous model kits that purport to represent a particular vehicle, yet miss some key features, and Academy's representation of "Baboon" of Battery B, 14th Armored Field Artillery Battalion of the 2nd Armored Division is a case in point, most noticeably the three-pieced differential cover that the kit provides. 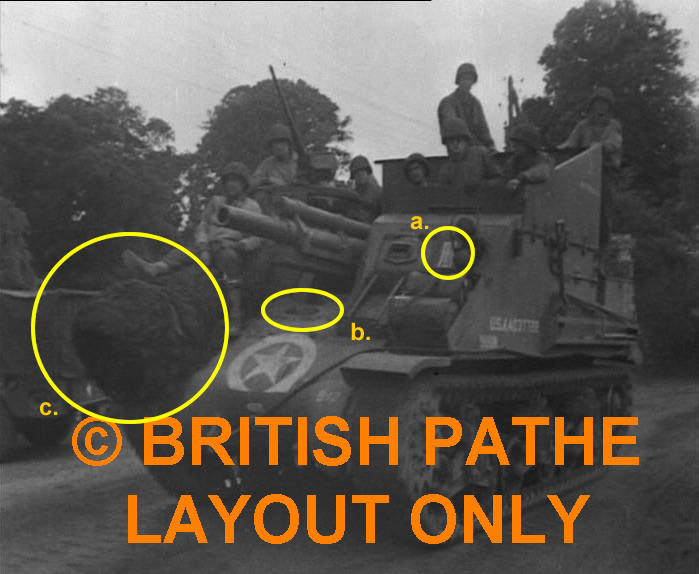 Production of the Priest began in April 1942, and early vehicles had the three-piece differential housing cover; the earliest of the M7s had the cover with the horizontal notch on for the 75mm gun on the sponson of the M3 Lee tanks. 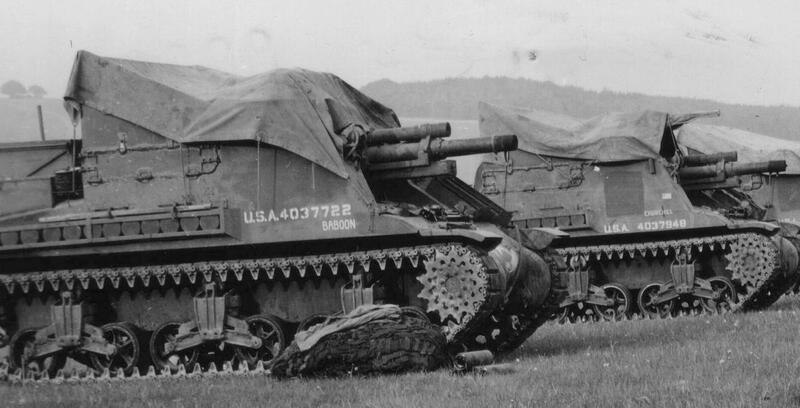 At some point in the fall of 1942, the one-piece E4186 cover was introduced into the assembly line for a brief period. 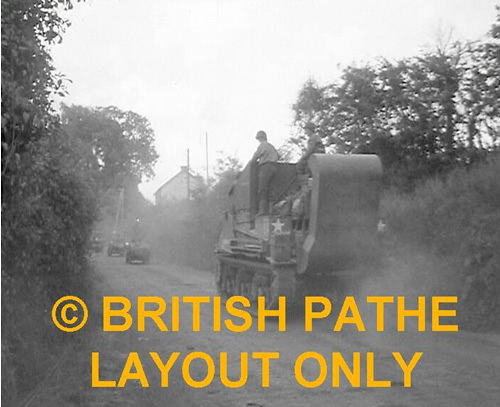 Then, production reverted back to the three-piece transmission vehicles until the later, sharp-nosed cover was applied to the late M7 Priests (as seen on the Italeri kit). As these photos clearly show, Baboon has the one-piece E4188 differential cover. Based on its registration number 4037722, documentation tells us it rolled off the assembly line as serial number 806, so it's likely it was built later in 1942. It's possible it could have seen action as early as December, 1942, in North Africa. The 14th Field Artillery Battalion was activated in 1940 under the 2nd Armored Division, and divided into two batteries, A and B. The battalion saw little action after landing in Tunisia, but things began to pick up in Sicily, and the unit continued to serve with distinction in Normandy, Northern France, Rhineland, and Ardennes-Alsace. Baboon likely landed at Normandy mid-day on June 10 amid the carnage on Omaha beach and three days after the 2nd Armored Division set up its first headquarters in Saint-Laurent-sur-Mer. Though it was several days after the initial invasion, there remained pockets of resistance and snipers, and the Luftwaffe was still a deadly menace, often striking at night. The division moved to the area around La Mine and was held in reserve until spearheading Operation Cobra on July 25. Baboon is rather unique as there are photos from all sides of the vehicle, at two different points in time. And the photos provide the info needed to equip Baboon with the extended walls and deep water fording ventilation stack. The above picture shows Baboon with other Priests in its company lined up in preparation of the invasion. The side of a wooden storage container is seen on the back deck behind the stowage box. This box, presumably made of wood, is also seen on another Priest in the photo at the bottom of this page. Given the amount of gear carried by the seven man crew, and the desire to keep it dry as the Priest landed in France, such a large box would be expected. There is a reel of telephone wire to the right of the fixed vehicle stowage box; these also appear on the opposite side of this and other Priests. As the vehicles, when in battery, communicated with fire control via hardwired telephones, an ample supply of wire was a necessity. Mines occupy the rack that is more typically seen on half-tracks; the purpose of the wooden pole strapped to the rack is unknown. 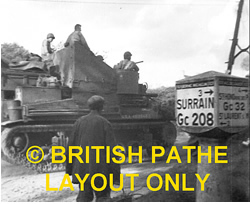 There are some items on the front glacis that are not seen in subsequent photos. The seams of the side armor portions are filled with an asbestos grease compound. Finally, note the different way Baboon is marked compared to the Priest behind it. Both appear to have had stars that were painted overbefore the invasion. Baboon shows up again in a British Pathe newsreel shot in France. The frames of the film, originally posted on Missing Lynx on January 6, 2004, are shown here for educational purposes. The newsreel is availalbe for viewing here: www.britishpathe.com/record.php?id=23408. As much as the images reveal, they also pose some questions. a. There is a white marking to the left of the headlight. What does it represent? b. Is the front filler cap still covered with waterproofing? c. Is this really camo netting, or a French buffalo? Note to the left side, the rear corner of a Dodge WC51/52 "Beep" can be seen. Perhaps this truck is being used by the film crew? It is interesting to note there is no took rack on the rear gate. a. What do the markings on the extended wall represent? b. The headlights and horn appear to be covered. Is this a typical canvas cover or waterproofing? c. The white marking to left of headlight isn't any clearer. d. It's unusual to not see any tie downs on the fighting compartment walls (see top photo as well). e. There are no sandshield strips at the bottom of the walls (also apparent in the top photo). The cameraman as able to shoot Baboon both coming and going, and the photo below shows white stars crudely painted onto the rears of the stowage boxes. Also visible in the distance are a line of jeeps. 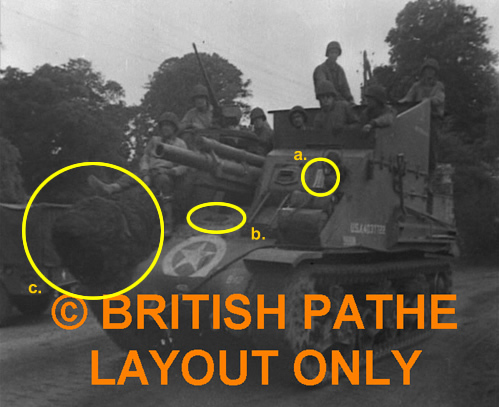 The adjacent image of another 2nd Armored Division Priest, named "Conflict," is from the same Pathe film. This is a later model Priest with the extended pulpit, and its pioneer tools are mounted below the pulpit on a carrier more common to softtops such as the 6x6 cargo truck and Dodge vehicles. It clearly shows the wooden storage container remarked upon at the beginning of this page. The container appears to have a bar running its length, from which a couple musette bags are hung. There is a reel of wire sitting atop the fuel filler cap to the right of the stowage box, and what is likely a can of oil on the back fender. 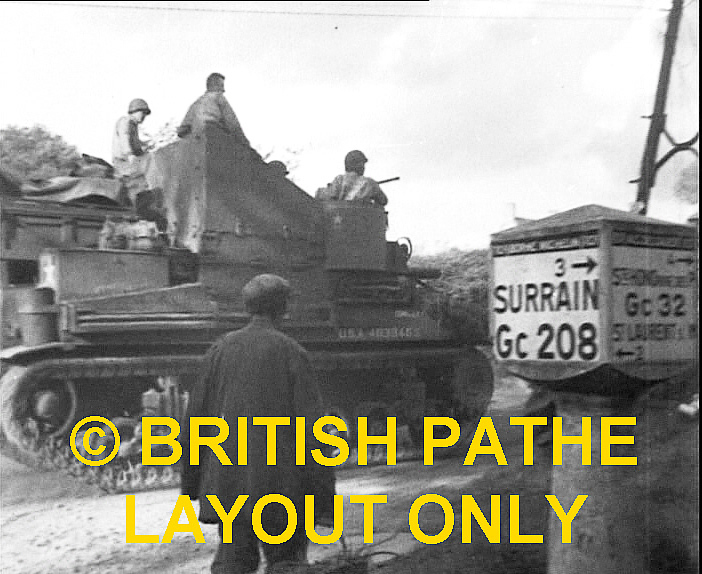 The movie frame confirms both the date and indication of the location of the vehicles, moving up several hundred yards from the beach and moving toward St. Laurent-sur-Mer, where the 2nd Armored Division had set up its initial command post on June 7 (http://www.history.army.mil/documents/eto-ob/2AD-eto.htm). On June 10, a new command post was established at La Mine, so I suspect the 14th AFAB passed through St. Laurent-sur-Mer to the new post. The landscape is similar to the location seen in the Baboon images, so it's likely that the footage of both Priests was filmed in the same approximate area, if not all in the same place. For the internal aspects of Baboon, I had to research and make some decisions about what transitional features to show. For example, the instrument panel changed from the long horizontal cluster that mounted on the front glacis to the version mounted on the sponson to the driver's left. 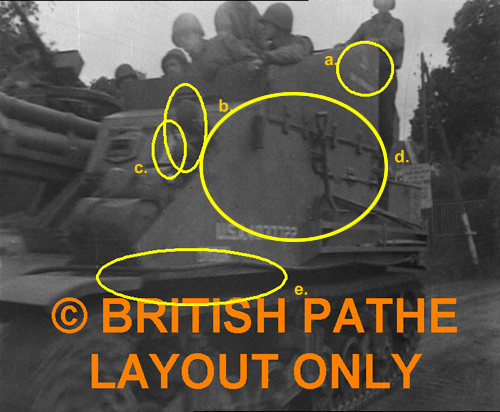 The Tankograd publication states the later sponson-mounted panel was used in mid- to late-production vehicles from chassis number 2318 onward. So I knew I had to scratchbuild a proper panel because the Academy kit provides only the later version. Since Baboon was built relatively early in the run, I went with earlier features, such as the open-topped stowage bin for the .50 machine gun ammo in the pulpit. A major supposition on my part was the complement of sidearms that would be used in June, 1944. Priests were originally equipped with M1 carbines. But the TM9-731E from August 15, 1944, assigns three .45 Thompson submachine guns. For variety, I went with the premise that these guys were better equippedofficially or unofficiallyfor the invasion and this gave me a chance to mount onto the driver's side wall three carbines in their protective canvas sheaths. The crew also would have two or three Tommy guns at hand should they get any unwelcome resistance from the occupiers. The Diorama: "Lafayette, Baboon Has Arrived!"